ArabSaga: Have two more journalists been killed in Syria? Syrian security forces reportedly killed Monday two independent journalists of Algerian origin but holding British citizenship in Idlib province, where they were filming a documentary on the Syrian uprising. 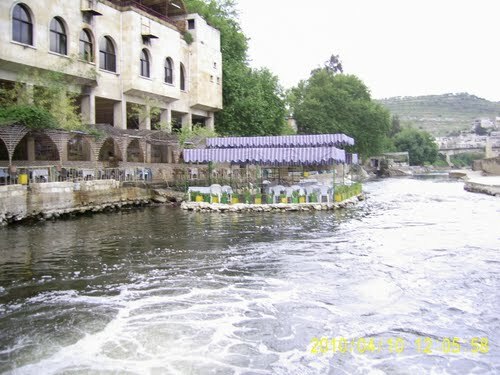 Algeria’s Echorouk Online today names the two victims as Walid Boudina and Wassim Lazayzieh and says they were killed near Darkush, a small township on the River Orontes in the Idlib region. Although Syrian activists on the ground and the London-based Human Rights Watch organization have confirmed news of the purported double killing, there has been no word on it in the British media or at the Foreign Office. Two Turkish journalists -- Adem Özköse and Hamit Coşkun – went missing around Idlib on March 11. Their whereabouts remain unknown, but the general belief in Ankara is that regime’s shabiha allegedly handed them over to Syrian intelligence. 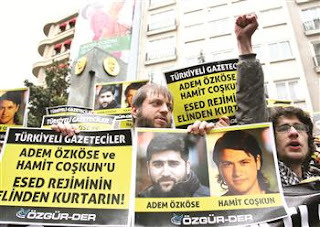 Özköse, a reporter from the Istanbul-based Gerçek Hayat magazine and the Milat daily, arrived with Coşkun, a cameraman, in Syria on March 5. They were last heard from on March 10. In London, The Guardian quotes the campaign group Avaaz as saying a Syrian activist who helped injured journalists flee Babr Amr, in Homs, after Sunday Times correspondent Marie Colvin and French photographer Remi Ochlik were killed, has been arrested by government forces. Avaaz says Jassim Khaled Diab, 35, was ambushed Saturday outside the village of Nazariya bordering Lebanon. It describes Diab as "instrumental in securing the delivery of life-saving humanitarian aid to besieged cities and towns across Syria". It also credits him with evacuating the injured across the border into Lebanon so that they could receive appropriate medical care. Avaaz says he was trying to help one such person across the border when he was arrested. His companions managed to escape and transfer the injured person to a safe area. According to Avaaz campaigner Wissam Tarif, “Jassim embodies the courage shown by the Syrian people who are locked in a bitter and bloody struggle against a murderous barbaric regime. Jassim has saved dozens of lives by evacuating patients across the border so that they could receive medical treatment and by delivering humanitarian aid to besieged cities. He was fighting for a brighter future.